"The analysis of the data collected during the study suggests that the effects of magnetic treatment varied with plant type and the type of irrigation water used, and there were statistically significant increases in plant yield and water productivity (kg of fresh or dry produce per kL of water used). In particular, the magnetic treatment of recycled water and 3000 ppm saline water respectively increased celery yield by 12% and 23% and water productivity by 12% and 24%. 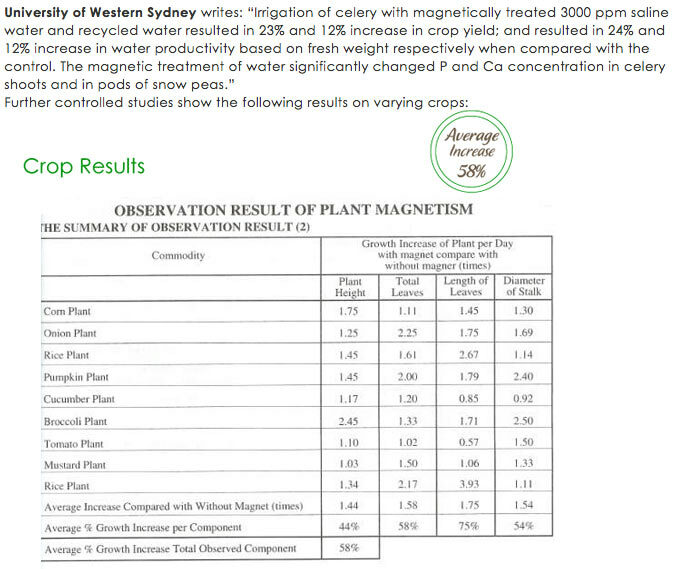 For snow peas, there were 7.8%, 5.9% and 6.0% increases in pod yield with magnetically treated potable water, recycled water and 1000 ppm saline water, respectively. The water productivity of snow peas increased by 12%, 7.5% and 13% respectively for magnetically treated potable water, recycled water and 1000 ppm saline water."